Robert Monteleone is a passionate and creative professional Adelaide based commercial photographer with extensive experience in product photography and website photography in the automotive, audio and music industries. Commercial Product Photography &​ Lifestyle Photography for most types of products and for all media use including advertising, websites, magazines, printing, eBay product photography, Amazon product photography & more. Inquiries are welcome. Please call Robert on 0438 346 788 or Email. Client satisfaction guaranteed. Product Photography and graphic artwork by Robert Monteleone. Product photography in Adelaide you can definitely trust! Commercial Photographer Robert Monteleone was privately employed in a marketing role from 1992 to 2006. His daily work included product photography, car photography and graphic arts while designing and photographing the company’s multi award winning website, glossy product brochures, posters, press releases, posters and magazine advertisements. Car photography, and other product photography was regularly supplied to numerous Australian motoring and electronics publications. From 1995 - 2005 Robert was also responsible for designing, editing and photographing a popular automotive magazine - catalogue publication known as CAR TOYS, with a print run of 15,000 copies per annum. 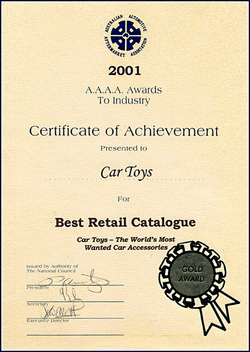 The retail CAR TOYS magazine was sold nationally in newsagents, and won the Australian Automotive Aftermarket Association's Best Retail Catalogue Award in 1996, 1997, 1998, 2001 & 2002.